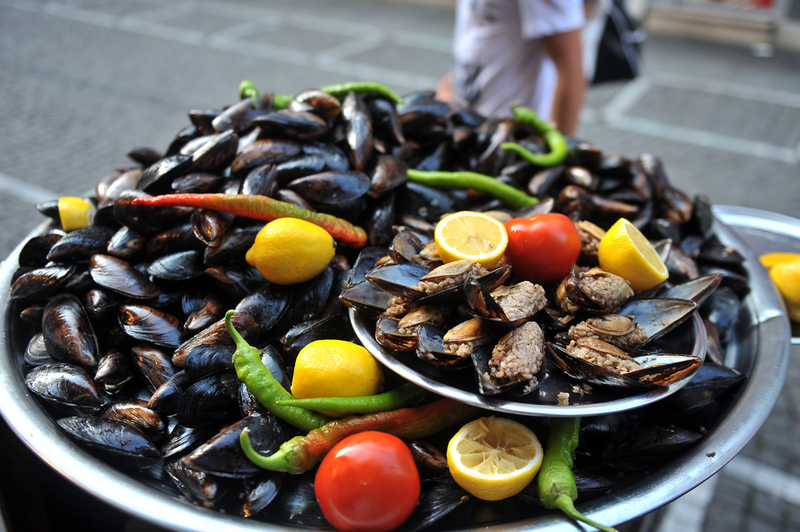 The Top 10 Street Foods in Istanbul - renk. The Top 10 Street Foods in Istanbul - renk. Istanbul is a hectic city with more than 14 million inhabitants. 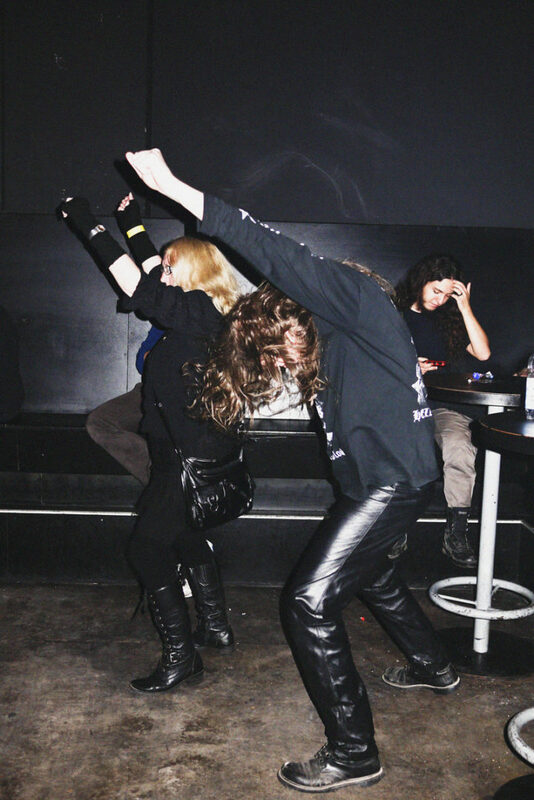 Despite the crowds of people and the chaotic traffic, the metropolis attracts more and more young people. Yes, Istanbul has charm. 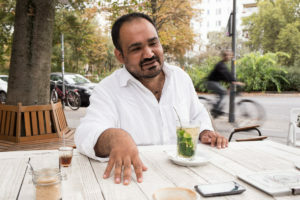 This is due not only to its multiculturalism and centuries of history, but also to the countless small food and drink stands which offer all sorts of treats. We have made a list of the best snacks and drinks on every street corner and which complete any day in Istanbul. Enjoy your çay with simit! If you go to Turkey and do not try Turkish tea you have missed out on the joy of “tavşan kanı” (Turkish for rabbit blood). The deep red, hot tea with its strong smell is served in small glasses with a curved waist on traditionally ornamented saucers at any time of the day. 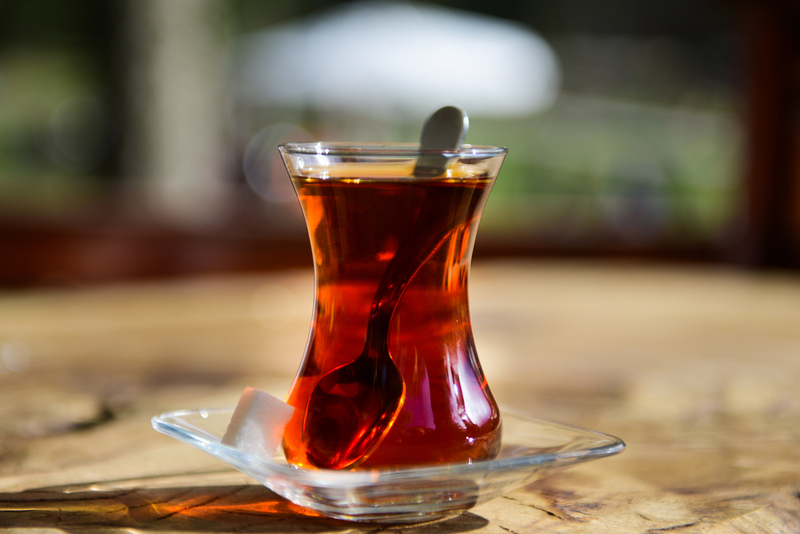 Most Turks do not leave the house without drinking at least one glass of çay. If you’re pressed for time, you can also enjoy çay on the ferry between Europe and Asia. 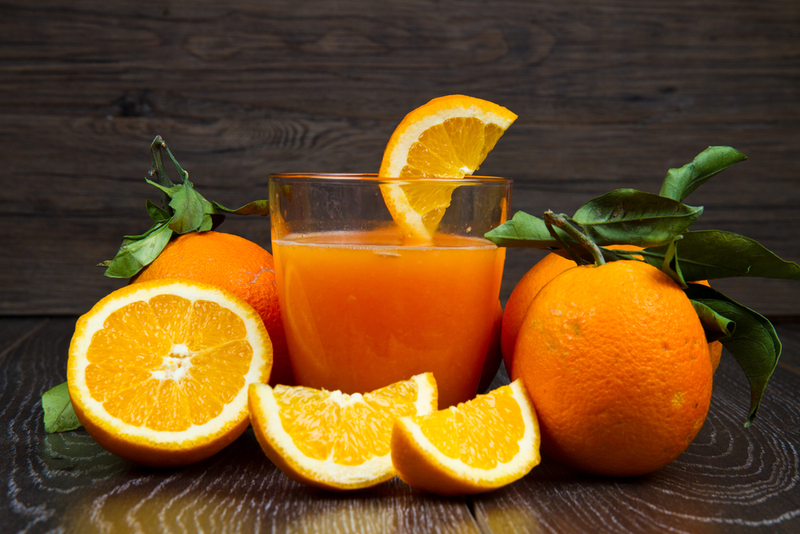 Many people from Istanbul start their day with a glass of freshly squeezed orange juice. In contrast to how expensive it is in Germany you can get this dose of vitamins on many street corners for just one lira. If you like you can also include fresh pomegranates, carrots, apples, grapefruits or pineapples. Autumn has arrived and the boza sellers are back at work. The half sweet half sour drink is mainly sold during the colder months because it doesn’t last well in the heat. 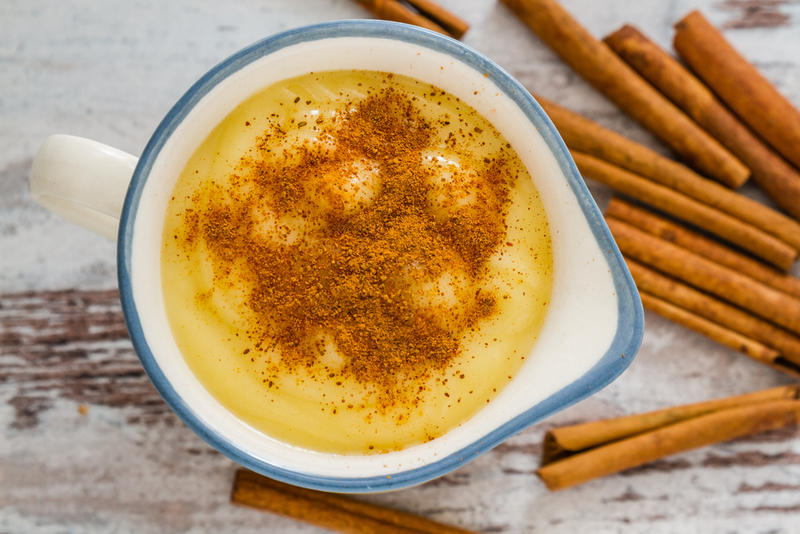 You have to taste the unusual mixture of millet, sugar, cinnamon, yeast, flour and yogurt. If you drink çay on the ferry, you also have to buy a sesame ring – and a second one to feed the seagulls. Many sellers also offer cream cheese or Nutella to have alongside it. 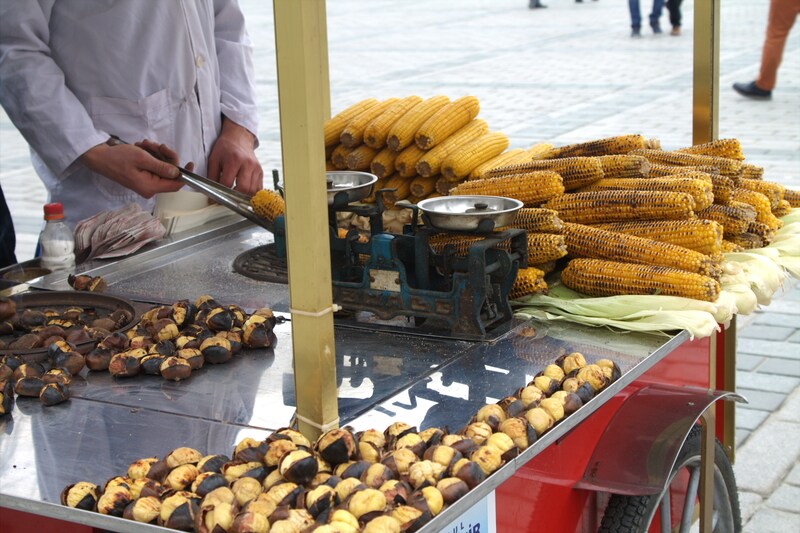 If you can see a small cloud of smoke above a food stand, the chances are corn on the cob is sold there. You have the choice between the version cooked in the large pan or the crispy corn on the cob from the grill. Either you like mussels or you do not. But either way, you have to try the Turkish version, filled with herbs and rice. For optimal taste, the seller drizzles lemon on the mussels and you can enjoy them in a single bite. Kokoreç is also an acquired taste. 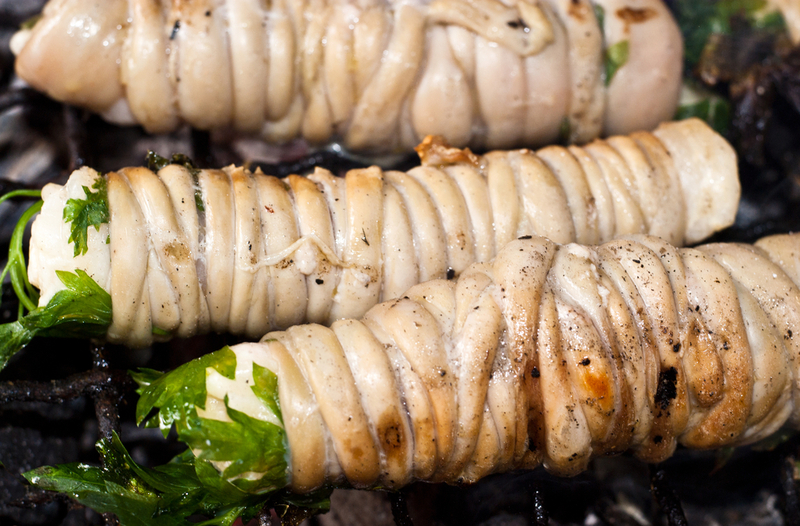 It mainly consists of lamb intestine wrapped around a spit. This roll is grilled like a kebab, then spiced and served and served with bread or on a plate with salad. Autumn is chestnut season. 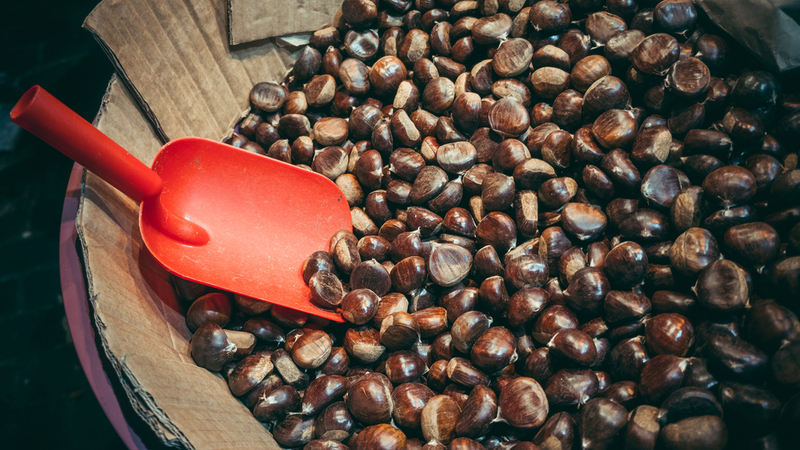 But you can also find chestnut vendors on Istanbul’s streets in the spring and summer. They usually stand next to corn sellers and sell their grilled chestnuts standing in a thick cloud of smoke. 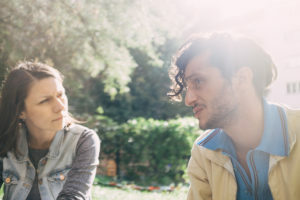 A sweet and healthy change. Now let’s get to the sweet treats. 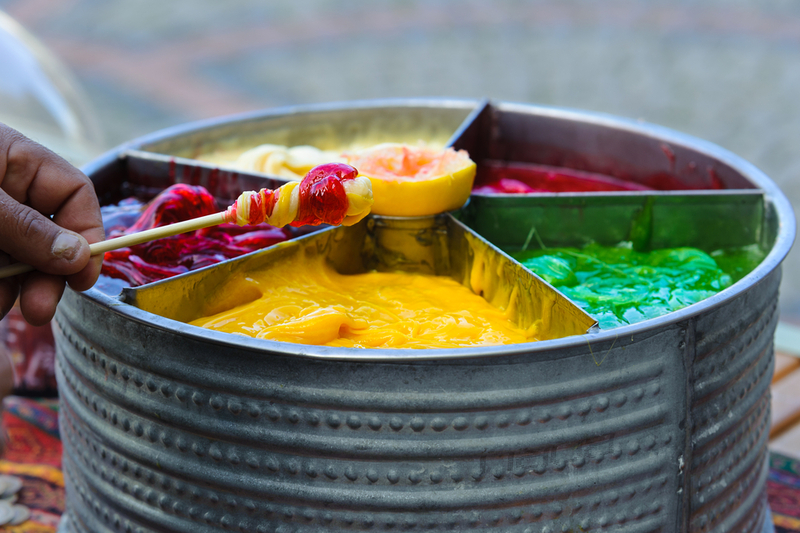 The colourful palette of colourful pastes almost reminds you of an art lesson. But it is actually called macun şekeri, and it consists of a variety of flavours wrapped together on a stick which you can lick like a lollipop. This legacy of the Ottoman Empire dates back to the 15th century, when people believed in the healing powers of the sweet. 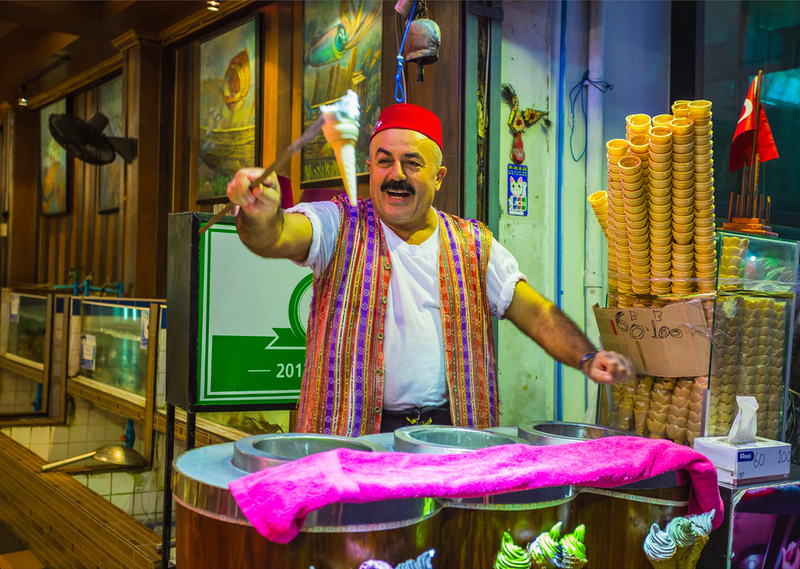 You will only find this unique ice cream from the city of Kahramanmaraş in Turkey. The manufacturing process is extremely difficult and lengthy, but it is all worth it. On the street, the sellers can be immediately recognized by their traditional red-gold costumes and the bells hanging from their stands. Be careful when buying: as soon as you think you have the ice cream cone in your hand, it is already gone. The cunning sellers know how to entertain tourists. 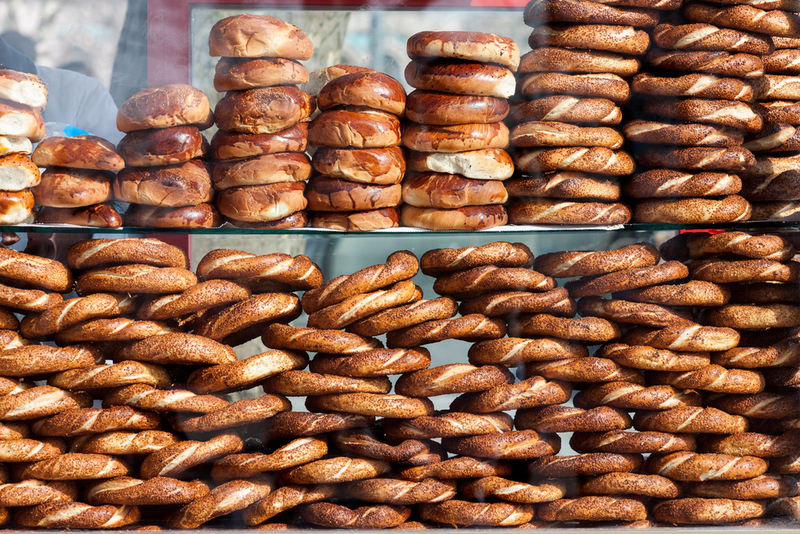 This list is by no means complete and represents only a fraction of the culinary delights that can be found on Istanbul’s streets. Ayran, balık ekmek, kumpir, döner, dürüm, baklava, lokma, şalgam suyu, mantı, çekirdek, börek, tandır, pide, köfte, gözleme, poğaça, salep and much more awaits you in Turkey.